2 x 1 Photovoltaic Solar panel Flat surface fixing. These photovoltaic Panel flat surface kits have been manufactured to provide a method of attaching solar pv panels onto any flat surface. These can be used for mounting two solar modules in a horizontal orientations when using our support rails. Each kit will include PV rails and the specifically manufactured flat surface panel plinth. 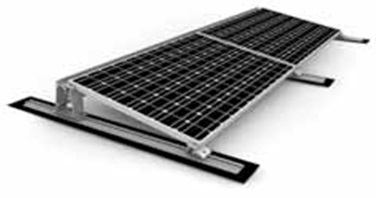 This can be used for ground mounting two photovoltaic panels, or can be used for a flat roof photovoltaic system.